In digital advertising, an SSP is a Supply Side Platform. In non-technical terms, it’s computer software allowing websites to sell ad inventory programmatically and receive payment for it. At Mediavine, you’ve likely heard us refer to the ad partners, or ad exchanges, we work with. SSP is the official term for most of these companies, many of which you may know, such as Google AdExchange, Rubicon Project, Index Exchange, OpenX and AppNexus. These SSPs are the companies submitting the bids in the auction of auctions we run during header bidding, but what exactly goes on behind the scenes to generate those bids for the advertising inventory on your site? What are the SSPs actually doing? Each SSP we work with is integrated with yet another acronym, the DSP. DSPs, or demand side platforms, are the advertising version of Supply Side Platforms. Advertisers run ads via DSPs, submitting their ad units and campaign targeting parameters. They’re paying the DSPs, who in turn pay the SSPs, who pay the publishers. The SSPs do more than just collect payment, though – they also control the auctions. As you may recall from our header bidding post, these auctions take a fraction of a second in RTB (Real Time Bidding). 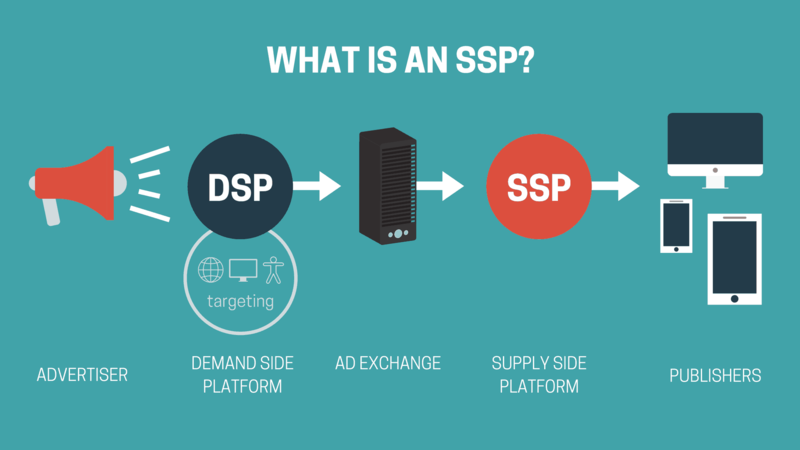 SSPs are potentially connected to up to 100 different DSPs, each of which connect with tens of thousands of advertisers. In real time, the SSP must figure out who a user is, send that data to the DSPs using cookie matching or user syncing, along with other information about the ad impression (average viewability for that unit, the domain, etc.) and get back bid responses. When they receive those bid responses, they run their own algorithms, and pick a winner to send to the publisher. Mediavine then runs its own auction – why we call header bidding an auction of auctions – to determine the winner, or who gets to serve an ad. As publishers, working with multiple SSPs is beneficial due to market inefficiencies. Despite working with mostly the same DSPs and advertisers, different SSPs will often come back with different bids; we’re able to take the highest. Even in a perfectly efficient market, there can be value in using multiple SSPs, as many bring unique demand, such as unique advertiser relationships, or technology to the table. Take Google AdExchange for example. Google offers unique demand through its Google AdWords marketplace, which you can think of as a DSP, as well as great “user matching” technology through their data. Companies like Facebook offer similar models and value. Long term, we expect some consolidation, especially amongst smaller SSPs that don’t bring unique value, but in the immediate future, there’s room for multiple SSPs. As publishers, why do we work with SSPs instead of directly with DSPs, or even advertisers themselves? Why are the middle men even necessary? Honestly, when it comes to the world of header bidding, there’s a major gray area; Mediavine does work with some DSPs and advertisers directly. For the most part, however, we go through SSPs instead of DSPs because it’s more efficient, even at our larger scale, for both DSPs and publishers. DSPs need only to connect with a handful of SSPs to reach the entire world, while SSPs need access to just a few DSPs to reach nearly all advertisers. Why does Mediavine specifically need SSPs? In a sense, Mediavine has become an SSP in itself. We work with publishers, DSPs and advertisers directly. So why still go through SSPs? Even at our size, with hundreds of millions of unique visitors and billions of ad impressions, we’re still small in the overall web ecosystem. We may be one of the top publishers at all of these exchanges, but we’re still one among many, and advertisers continue to buy via the open marketplace and through their preferred supply paths. Mediavine wants publishers to maximize the value of every ad impression, and working closely with SSPs allows us to provide optimal results. How many more times can we say the word SSP? This seems like enough for now. We’ll likely continue using more generic words like ad partners because again, we work with more than just SSPs. But you may often hear us refer to someone as an SSP. Hopefully now you know a little more about who, and why, that is.